New experiences are scary. It’s NORMAL! We used to practice on each other and on dummies. I mean, mannequins… We even had ones that moved, talked, and ALWAYS died. Simulation helps- it does not ease the dread of the first time. 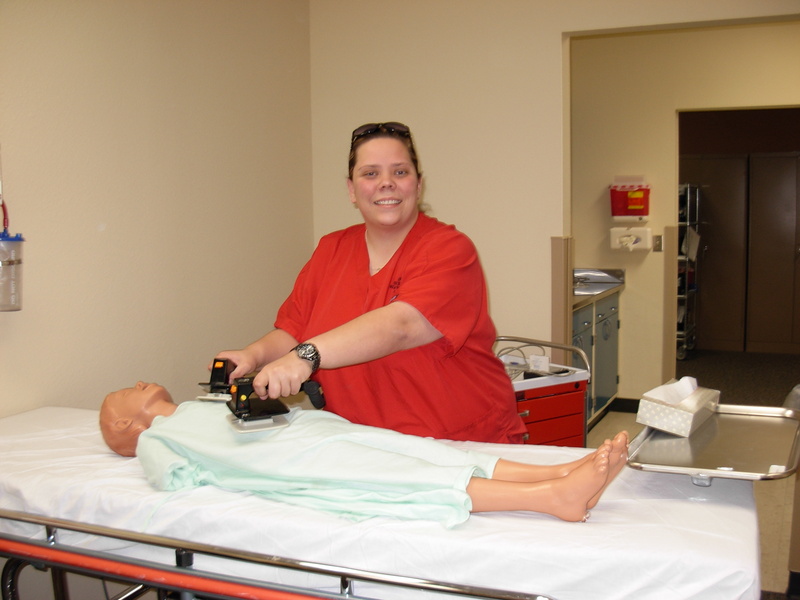 I have never grinned and posed for a photo when I was defibrillating a real person. Hospitals are horrible, awful, no good places. Not really, obviously. Well. Kinda. I hate hospitals. I am filled with dread and anxiety when I enter one as a patient, family member, or visitor. The difference in my feelings is astonishing when I am walking those same halls as a healthcare provider. I am a nurse. I was a nurse first, and I will always be a nurse. The only thing change is I am now an Advanced Practice Nurse, aka- Nurse Practitioner, or midlevel provider. The point is I am still a nurse. I love nurses. They are quite basically my heroes. What other profession is filled with people who constantly provide care for complete strangers? I know, there are lots of them, that is not the point. I am talking about nurses here. Just bear with me. I love all the other service positions too. Nurses have this uncanny ability to make some of the most humiliating, unbearable, uncomfortable situations tolerable. Imagine being at your most vulnerable state, unable to walk or take care of your most private needs. Nurses step in and deal with the issue. It is no big deal. They have seen every body type and dealt with more situations than you can possibly imagine. All in a day’s work. I remember the first time I had to give a patient a bed bath. He was a gloriously demented elderly man in a nursing home. Let me just say, it was a MESS. I had never removed clothing from a grown person before, at least not in this manner. They actually teach you how to do this in class. In the class, the patient is always cooperative, docile, and helpful. The process is easy then. Now imagine a 150 pound man, who wiggles around like a toddler. Following directions? Not going to happen. That was the first time I genuinely believed I had made a mistake. Why would I want to do this? It was one of the hardest things I had ever done. For one thing, I was embarrassed. I finally went and got some help from some other students, and we were able to complete the task more efficiently. Let me tell you, I felt like a failure. Why was this so difficult? This is only my first clinical experience. I was never going to be a good nurse. This was the first time I considered dropping out of nursing school. I considered it every single semester. I felt incompetent most of the time. I wish they would warn you about those feelings. Turns out, every one feels that way at least part of the time. Fortunately, I figured it out. There are tricks and processes passed on by experienced nurses. A certain method to the madness of making a bed while a patient is in it. You learn efficiency in your movements. It gets better. The reason I tell this story is to reassure myself that every thing is hard the first time you try to do it. I am branching out professionally, and I may be placed in the position where I have to learn a new set of skills. These things intimidate me a little. What if I cannot do it? What if I embarrass myself? Then I take a deep breath and deliberately exhale slowly. I tell my restless mind to calm down and stop borrowing trouble. Then, I go to YouTube and watch another how to video. Yep. There are How To videos on YouTube for medical procedures. If that does not make you feel better, I don’t know what will. Here is the thing. You learn every thing you can about something, and you pay attention to the person teaching you. You have to trust your knowledge and abilities. Every one had a first time for new skills. I imagine they were scared and felt a sense of dread. Except for those weird adrenaline junkies who love new experiences, but I think they are freaks. I am working diligently to quell the voices that scream inside my head. I am preparing and telling myself to man up and just do it. I am working to trust and believe the people who tell me I can do anything I put my mind to. I am reminding myself of all the things that used to scare me and are simply routine now. I must remember I am either growing or dying. Today, I choose to grow. Previous It is Important. Or is It? Next Growing up in the information age. you do .Love you all and bless you always . And no I’m not saying that because I’m religious cause I’m not I say it with all my heart DO NOT EVER STOP BEING YOU AND NEVER GIVE UP . Thanks so much. I appreciate your thoughts. It is strange how we respond when forced to face mortality.